Traveling from Darwin to Perth along the Australian West Coast is like driving from Madrid to Moscow in Europe. More than 4,000 km of wild and diverse landscapes. Immerse yourself in the vast Kimberley Outback, stroll on white sand beaches along turquoise waters and explore national parks of indescribable beauty. And maybe you have the opportunity to see whales, dolphins, sharks, turtles, and even manta rays. The west is less touristy than the east coast and perfect if you like adventure and vast land! Here are all our tips to plan your road trip on the Australian West Coast. 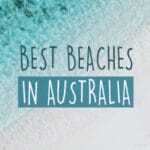 There are tons of attractions on the West Coast in Australia. 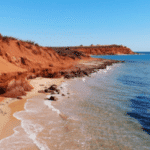 The highlights are, of course, the Karijini National Park and the beautiful gorges, the Eighty Mile Beach, which consists of seemingly endless white sand and turquoise waters, Exmouth for whale sharks (between April and July) and the Kimberley region, which is known for the baobabs and ochre soil. You will also find a beach that is completely covered with small shells, which is therefore called Shell Beach. Feed dolphins in Monkey Mia and see fascinating limestone menhirs in the Pinnacles Desert. One of the first steps is obviously to get to the West Coast! If you come from the southeast of the country, you will cross the Nullarbor Plain. 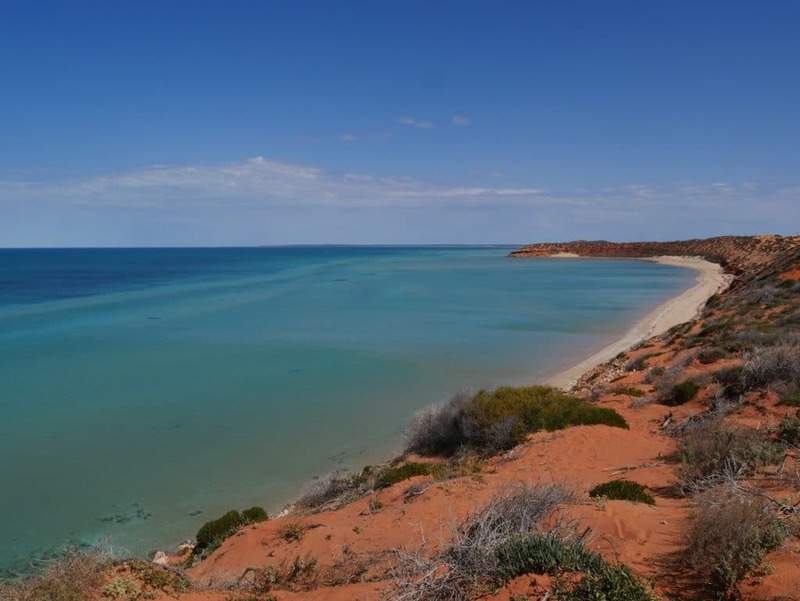 This is a desert that leads from the Eyre Peninsula in South Australia to the gold mines of Western Australia. You can also fly to Perth. This is ideal if you want to rent a vehicle or do an organised tour. 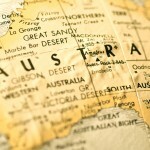 There are regular flights to Perth from Sydney, Brisbane, Melbourne, Adelaide, Cairns, and Canberra. You can rent a car, camper or motorhome in either Perth or Darwin. The best-known companies are Britz, Apollo and Travellers Autobarn. Compare their offers on the website MotorhomeRepublic. 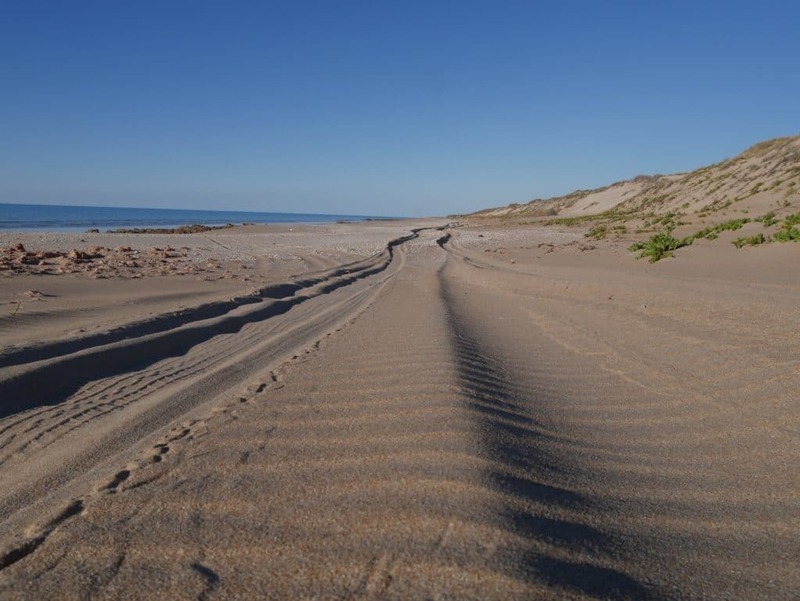 If you don’t want to drive all the way from Darwin, you can pick up a car in Broome, even though they have fewer options there. 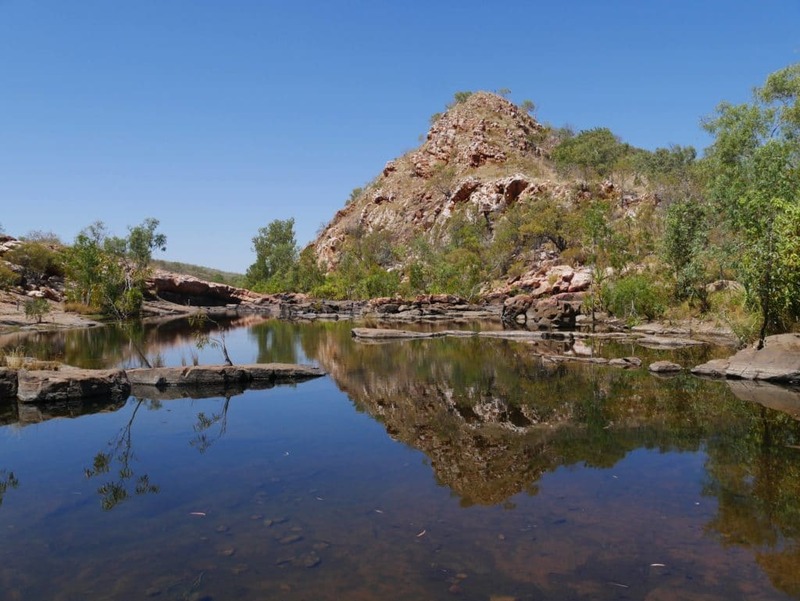 Good to know: If you take the Gibb River Road, it is advisable to have two spare tires per vehicle. They wear out faster on this unpaved road. Therefore, you often see people on the side of the road, having to change their tires. – Integrity Coach Lines: “Hop on / hop off” system for all places of interest between Perth and Broome. – Greyhound: only between Broome and Darwin. 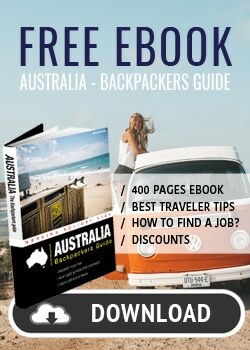 – The Magic Bus: Group of 25 backpackers of all nationalities (only from March to November from Perth to Broome). If you want to do the “Hop on / hop off” tour, plan your route in advance. Buses don’t run every day, so sometimes you have to stay in one place for several days. A good alternative is to find “Travel Mates”, co-travellers who already have a car. 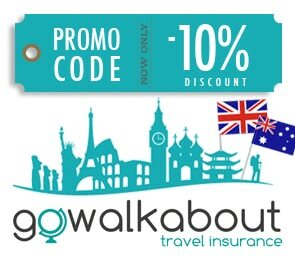 They are often looking for other backpackers who want to join them and share the costs. There are a lot of ads on Facebook or Gumtree! This is definitely a cheap way to get around. Don’t forget to meet your “Travel Mate” before you’re actually leaving. Just to make sure you have the same ideas and the same itinerary. Once you’re on the road, you have to spend 24 hours together! The west coast of Australia is huge. It stretches over thousands of kilometres, so the climate can be totally different from the north to the south of the coast. In Perth, the sun is shining for about 9 hours a day. The average temperature in summer is 29°C, but in February it can rise up to 40 or 45°C. Between June and August the temperatures are around 12°C. The Coral Coast has a warm climate all year round. From Cervantes to Exmouth there is a Mediterranean climate in the south and subtropical in the north. 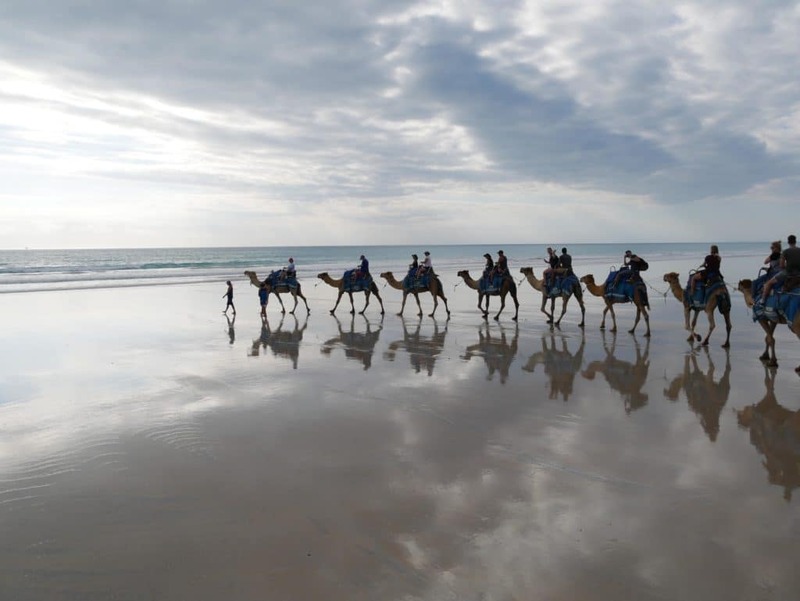 Broome and the northwest enjoy sunny days in the “dry season” (April to September) with temperatures around 29°C. From October to March, there are tropical rainstorms, high humidity, and temperatures around 30 degrees though. The best time for a trip on the west coast is the shoulder season. This is between April and June or between September and November. AVOID the rainy season in Darwin (and the whole Northern Territory) between December and February (January is the worst month). Some roads can be flooded and inaccessible. The seasons must definitely be considered when planning your trip. 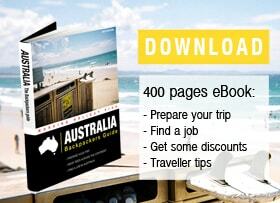 Take at least 4 to 6 weeks for a road trip between Darwin and Perth. If you don’t have that much time, you can travel the section between Broome and Perth in 3 weeks. Also, plan to spend a few days in the same place if you like it somewhere. In contrast to the East Coast, where there are a number of cities, the West Coast is very wild and not so densely populated. Along the coast, you may find motels or rest areas that offer accommodation, but the distance from one place to the next can be massive. Therefore, plan in advance where you can spend the night if you don’t want to camp. Wild camping is not allowed. However, you will quickly learn that there is enough space everywhere and that rangers rarely check. Nevertheless, avoid wild camping, especially in tourist areas. The goal is, of course, to have pleasant temperatures throughout the trip. Therefore, we recommend that you drive from Perth to Darwin, if you are traveling between April and June. In contrast, the period between October and November is better when driving from Darwin to Perth. Ending your trip in Perth can offer a few benefits. In the largest city in the west, finding a job, selling your car, or flying home from the international airport is easier. The distance between Perth and Darwin along the coast extends over 4,100 km. With a classic campervan (rent not included) you can expect up to $ 1200 for 3 weeks. That’s about $ 650 in gas, $ 300 in food, $ 250 extra. The largest car rental companies are Britz, Apollo, and Travellers Autobarn. However, not all of them are represented in Broome (and prices are usually higher in Broome). Darwin is better for renting a vehicle. You can easily compare different offers on MotorhomeRepublic. If you plan to visit several national parks, it is better to get a pass. It costs $ 46 and is valid for four weeks. In Coral Bay or Exmouth, you can swim with whale sharks or manta rays and snorkel on the coral reef. 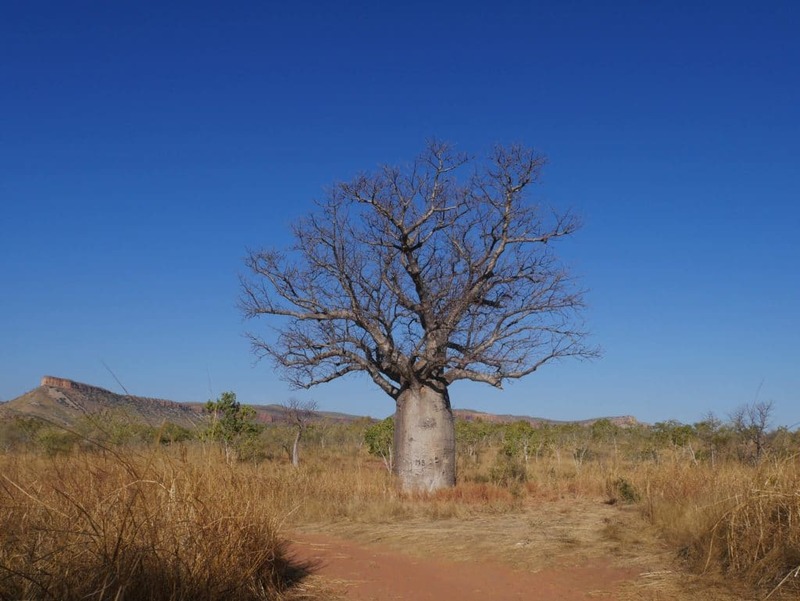 There are also organised tours to explore the entire coastline or just the Kimberley region. – Remember to take several water containers and refill them every time you get the chance. – You should also have a couple of gas bottles with you. The distances between villages are large and there are only a few cities. – Don’t forget to pack an air compressor. You will use it for regulating the tire pressure if you want to drive in sand.